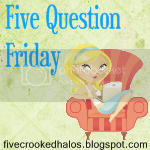 So I am linking up with 5 question Friday today. 1. If you were going to be stuck on a deserted island, which 5 books, movies, people and foods would you take along? 2. What is your thought on year round school? I think it's wrong because kids need a break from school and need time to spend with family on holidays. 4. What's the temperature where you are? It is only 16 degrees outside. 5. Are you a winter/spring/fall/summer person?